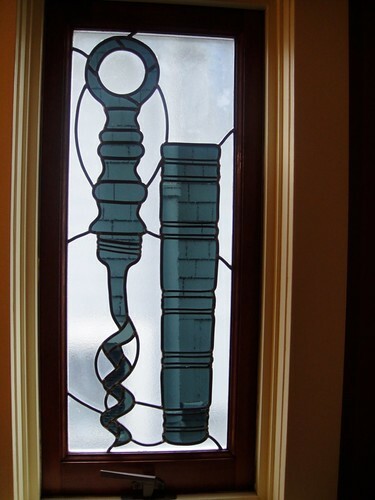 A couple of years ago, I stayed in this bed and breakfast in Vancouver called the Corkscrew Inn. It was my first time at a bed and breakfast, and even though I have decided I am not the bed and breakfast type, I really enjoyed my stay there. 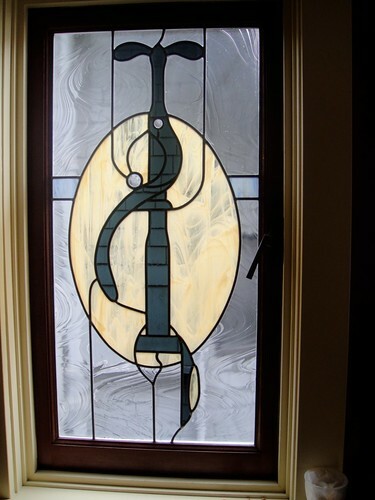 I especially enjoyed their use of stained glass windows and paneling throughout the house (as well as the breakfasts…homemade kiwi berry jam from kiwi berries grown in the garden in the back, and the best lemon ricotta pancakes I have ever had). 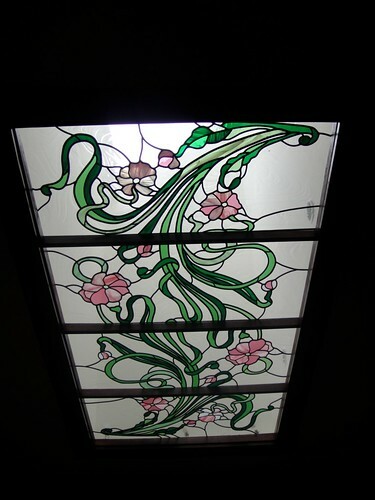 All the the pieces used throughout the house were all done by the propriator herself. Pretty awesome! 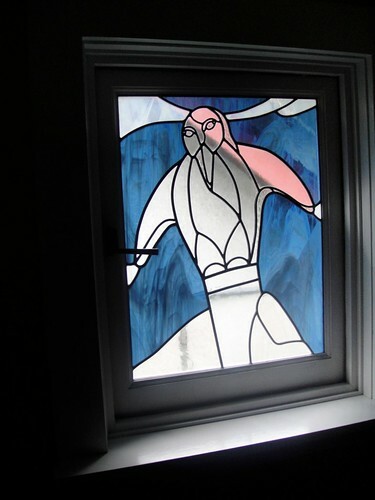 So, this past winter, I found that my local community center was offering a Stained Glass Workshop that would run for about 8 weeks where I would learn the Tiffany method of making a stained glass panel. I promptly signed up! 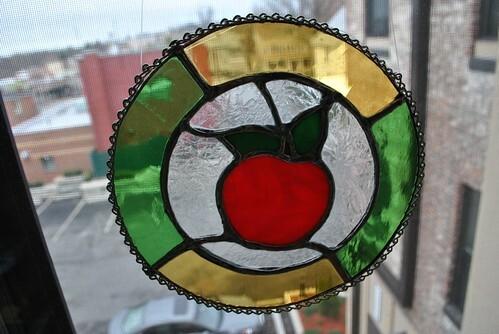 I chose a simple pattern of an apple and then chose my glass. There were only two of us in this class, and the other woman was advanced, so it was pretty much a private lesson for me. I learned how to cut, grind and foil my pieces. Then I spent much time trying to solder it and create pretty solder beads, but no matter how much I tried, my lines kept looking like oddly shaped worms in the middle of digesting something large. I am not adept at handling a hot soldering iron. After 8 weeks, I went home with my first panel! It was actually a pretty interesting experience. I had a lot of fun and only cut myself a couple of times (minor cuts)! 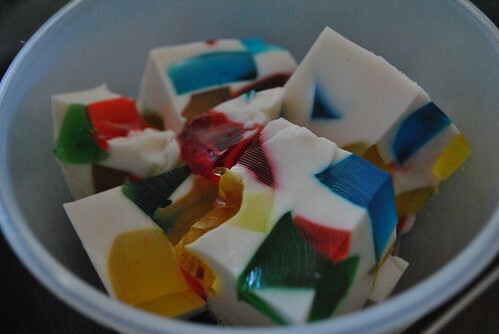 As I was taking this class, I thought about a jello dish I once made that was called Stained Glass Jello, or Broken Glass Jello. I had read about it a long time ago and tried it once based on a recipe from a New York Times article regarding the use of sweetened condensed milk in cooking. I tried it, and I liked it and since then have been looking for another reason to make it again. I think this was a good time. The method is actually pretty easy, and requires 7 items, including hot water. 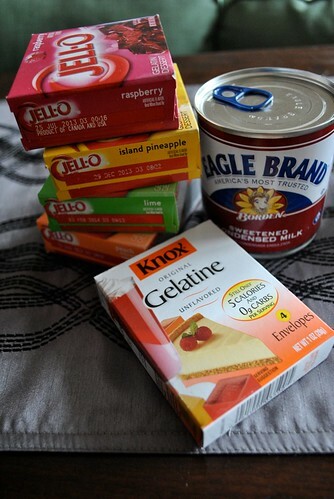 First, make the flavored jello. 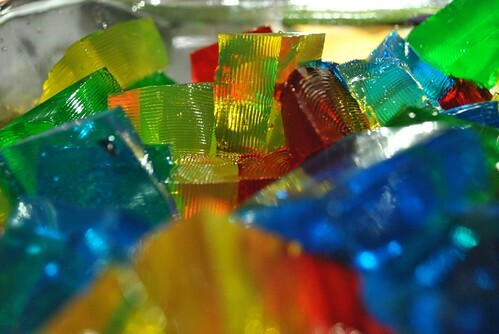 Used one cup of boiling water to dissolve each box of jello in a separate container for each. Put in the refrigerator and allow to fully set. 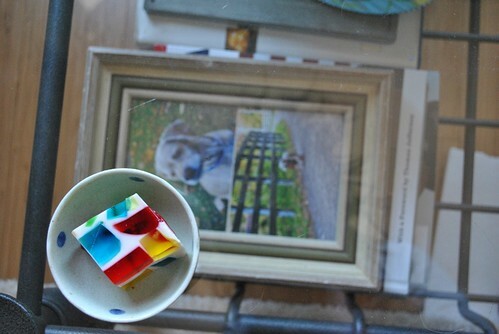 Once the jello is set, cut them all up into cubes and pour it all into a 9×13 container and toss the cubes around gently to mix it up a bit. I did this three times with three different containers. The 9×13 is the best, the loaf pan is the worst, and a 9×9 produces the largest sized cubes in the end. 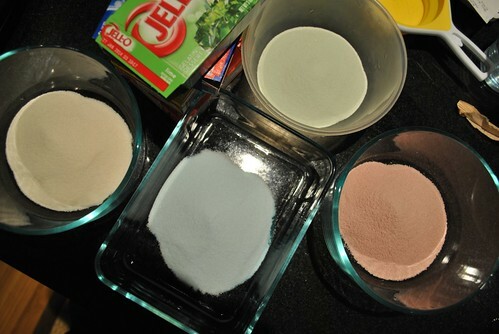 Dissolve the two packets of unflavored gelatin in a 1/2 cup of cold water and let it gel up a bit. Then mix in another 1.5 cups of boiling water and stir until dissolved. Pour in the can of sweetened condensed milk and stir until all mixed in. 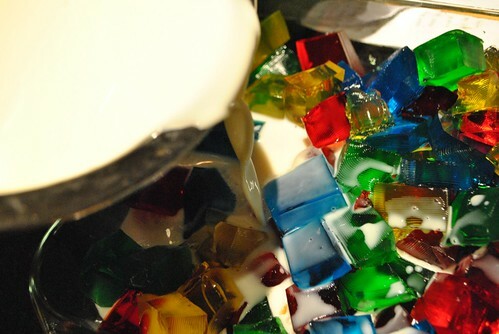 Let the mixture cool a bit until warm to the touch (you don’t want to melt the colorful gelatin cubes) and pour over the cubed jello. Put in the fridge and allow to set overnight. It’s a nice summer treat and very refreshing. 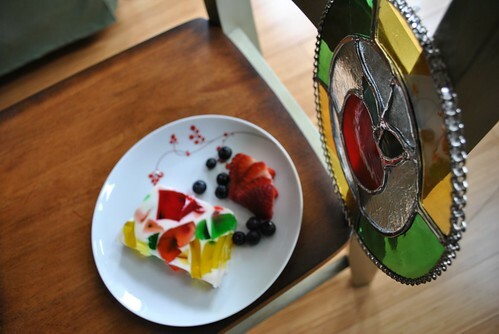 It takes a bit of time since you have to let the jello set twice. Otherwise, it’s super easy to make. As long as you know how to boil water. 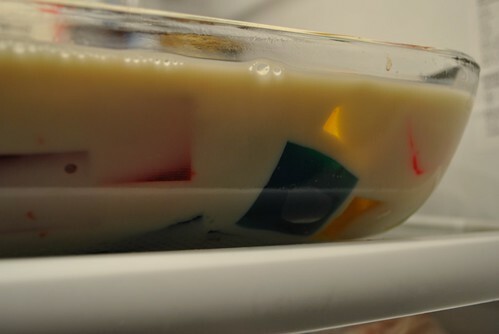 This entry was posted in Dessert, Uncategorized and tagged jello, stained glass, sweetened condensed milk. Bookmark the permalink. Have been wanting to make this myself. I keep meaning to, come fourth of july and whatnot. Yours looks awesome and colorful, just how Bill Cosby intended it!